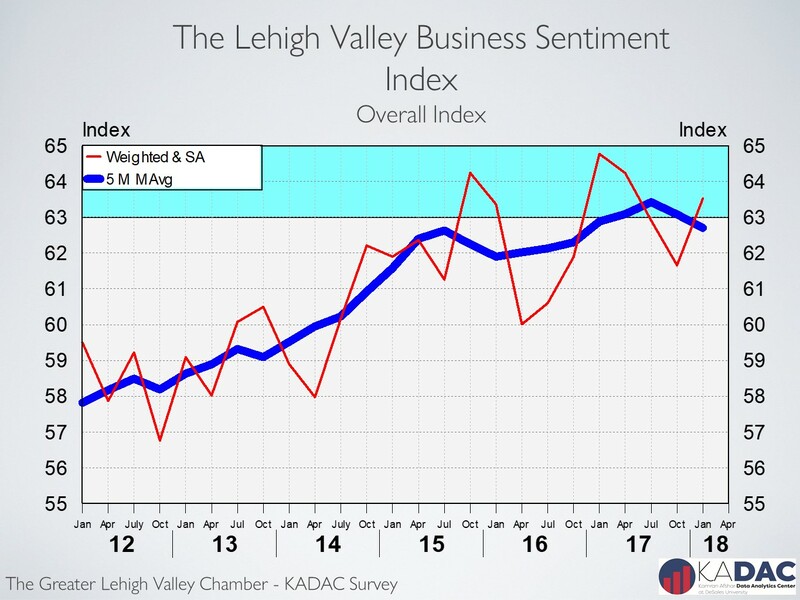 The Greater Lehigh Valley Chamber of Commerce -Kamran Afshar survey of the Valley businesses is a quarterly survey that has been collecting data since 1998. The January 2018 survey recorded the first increase in the index after dropping for 3 quarter in a row. 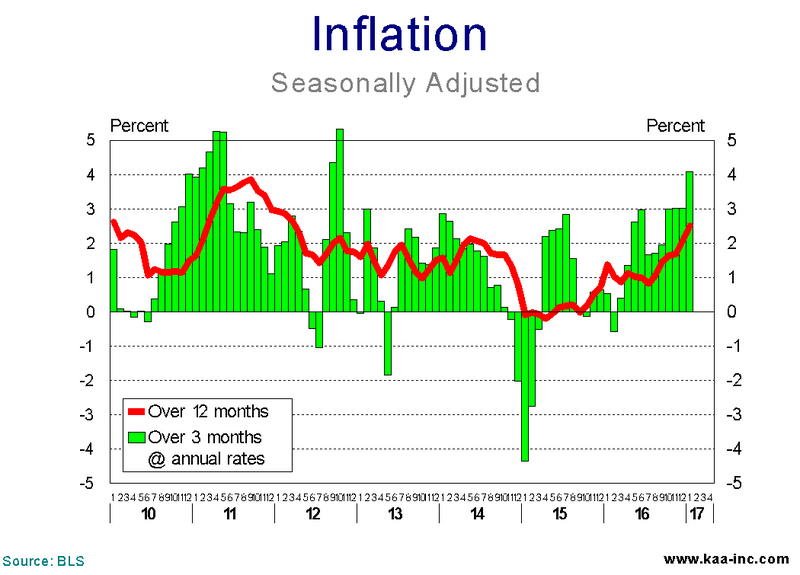 However, due to the relatively small size of the January increase, the index is still below its January 2017 level, and it is still trending down. 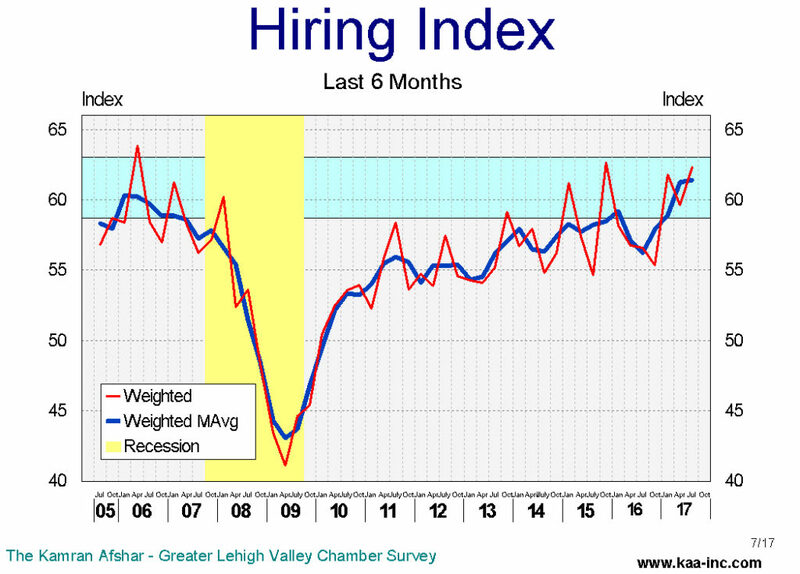 The index of hiring for the last 6 months rose by a significant 5.3% since October, nevertheless, it is still below its January of 2017 level. Long-term data shows payroll employment in the Valley dropping since June of 2016. While the decline is very small and it looks more like standing still, the fact that its growth has stopped causes concern, particularly since employment at the national level is continuing to grow. And as usual, the smallest businesses participating in the survey were the most stable in terms of employment. Eight out of 10 businesses with less than 6 employees did neither hire, nor laid off any employees. While only 4 out of 10 companies with more than 100 employees neither hire, nor laid off employees over the last six months. 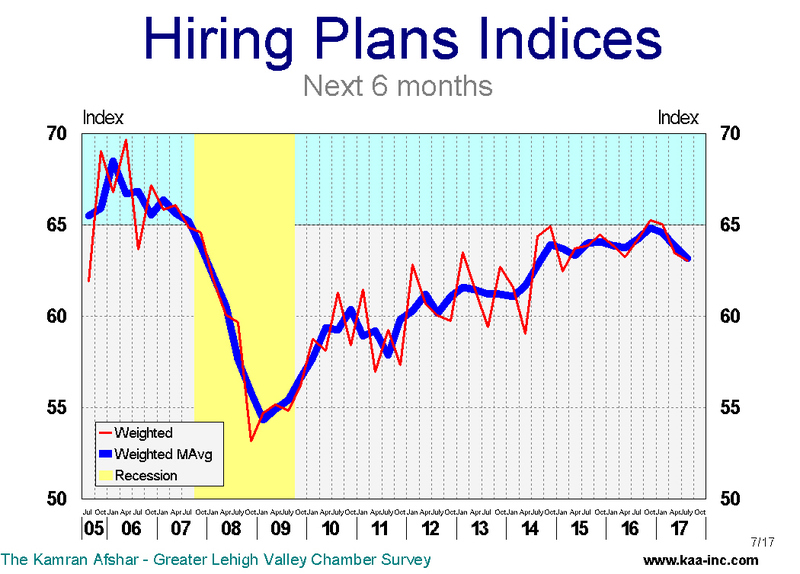 The index of plans for future hiring dropped slightly in January, however, this index is still trending up. 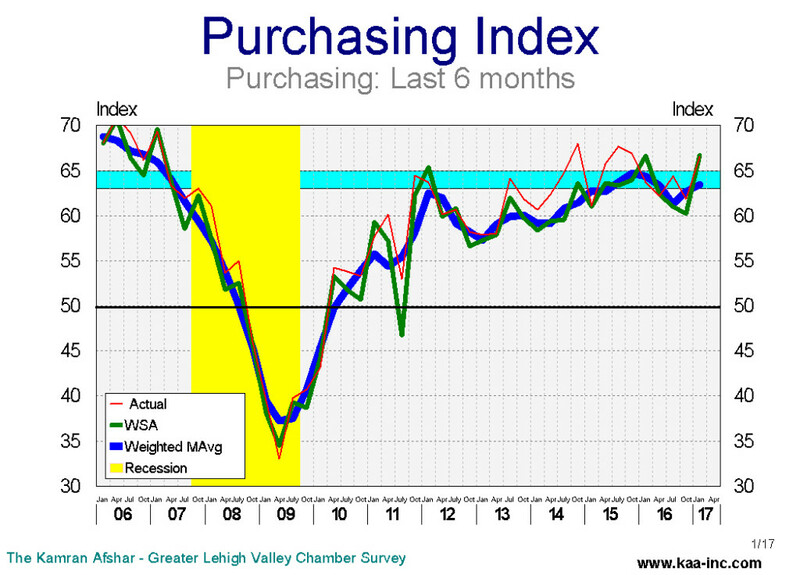 The index for actual purchasing over last 6 months rose by a significant 6.1% and despite that, it is still below where it was in January 2017. This index, similar to the overall index is still trending down. This is due to its drop in three quarters in a row. 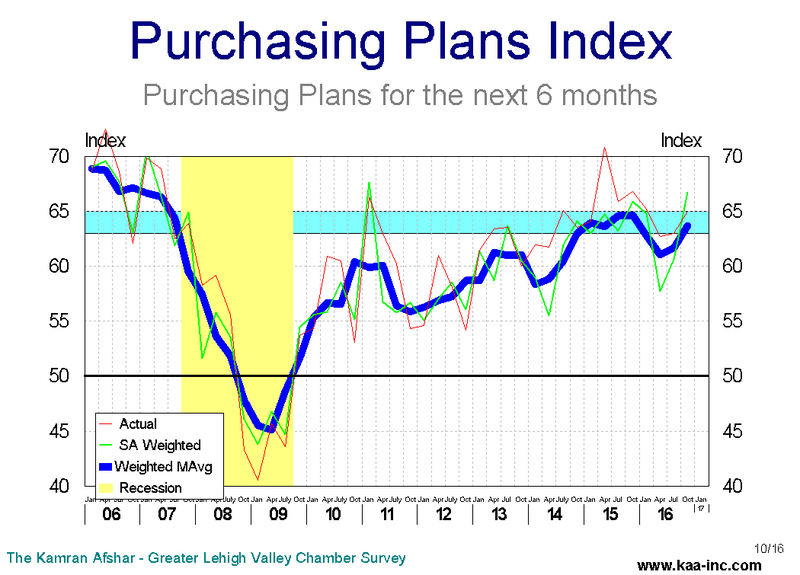 Purchasing plans for the future also rose by a good 4.2% between October of last year and January of this year, however, it is still below its January 2017 level and is also trending down. A lot of companies increased their expenditures after election based on expectations of rapid economic growth and had to then cut back to makeup for the overshot. With the tax reduction law in the books now, many of the participants in our survey are starting to test the waters again. The percent of businesses participating in the survey which did report an increase in their revenues in the last 6 months increased in January. I should add that this indicator was added to our list in 2014, so we don’t have real historical references for it. So our comparison is based on short term data. 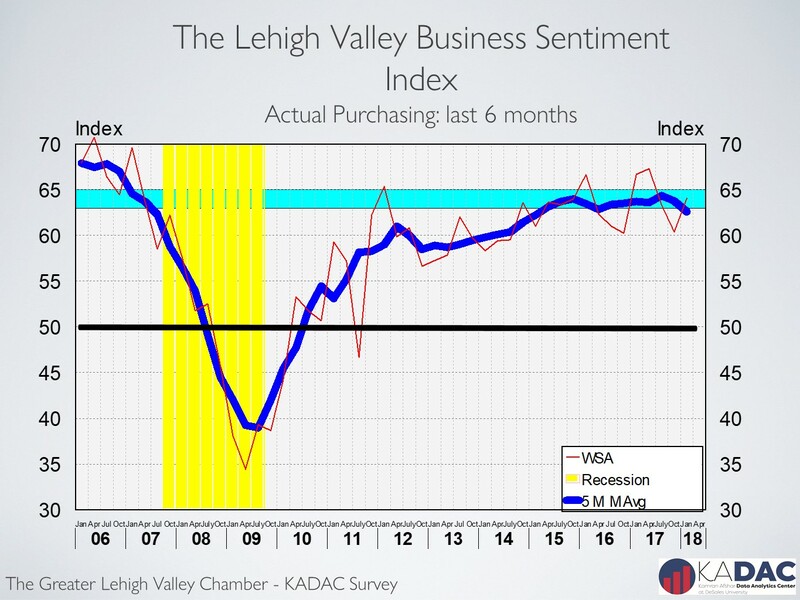 One of the surprising results of our surveys is the observation that the percent of local business which expect increases in their future revenues has been slowly dropping since early 2016. This could become a concern should this trend continues. After the election we clearly observed a spike in Valley’s business sentiment. That, however, quickly went away as expectations were not met. 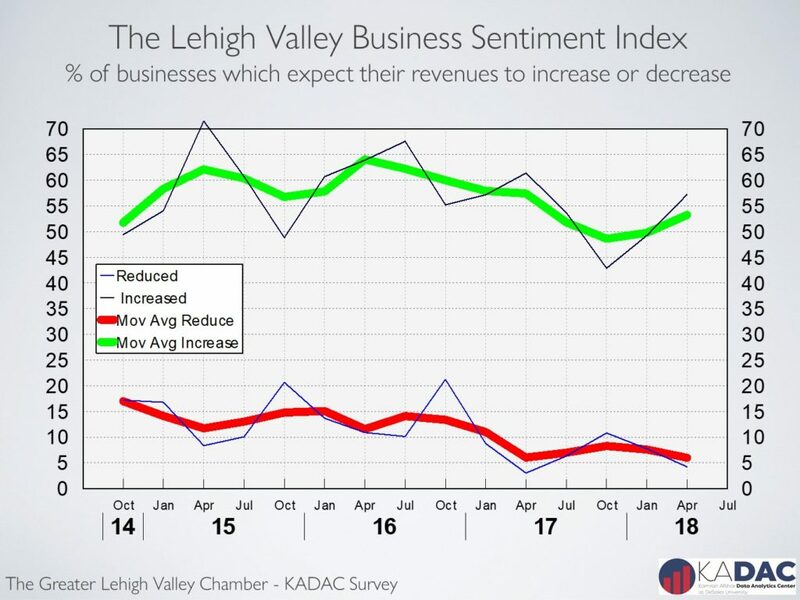 However, with the passage of the tax reduction law, we observed a measurable improvement in the Valley’s business sentiment in January 2018. While the new tax law provides clear benefits for large and multi-national businesses, its value to small and medium size businesses is not as clear. Most companies will discover their true share of this pie in the coming months. 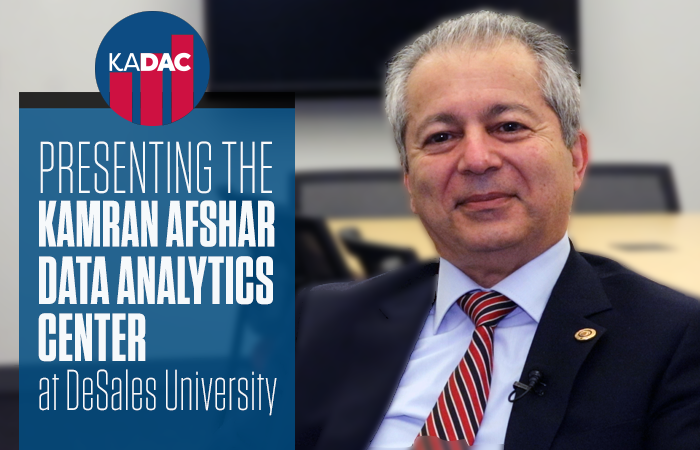 The Kamran Afshar- Greater Lehigh Valley Chamber of Commerce survey of the Valley businesses is a quarterly survey that we have been conducting for the past twenty years. 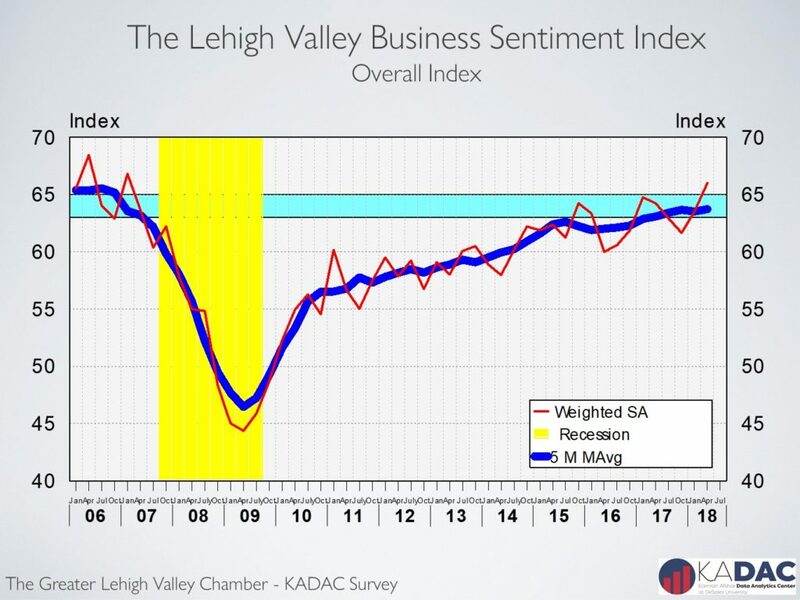 According to the April survey, local business sentiment gave back some of its January gains but it is still above its last October’s level. 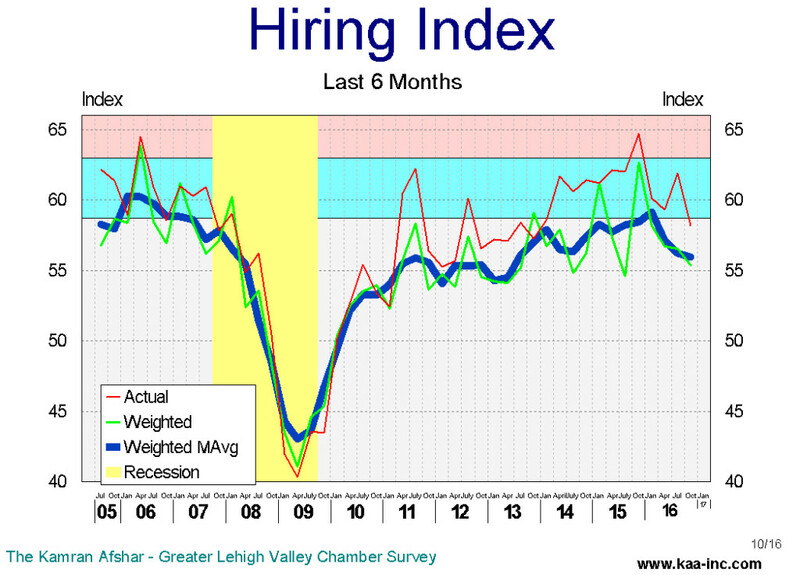 The drop from January came almost entirely from the employment sector; local employers have reduced their actual as well as planned hiring since January. 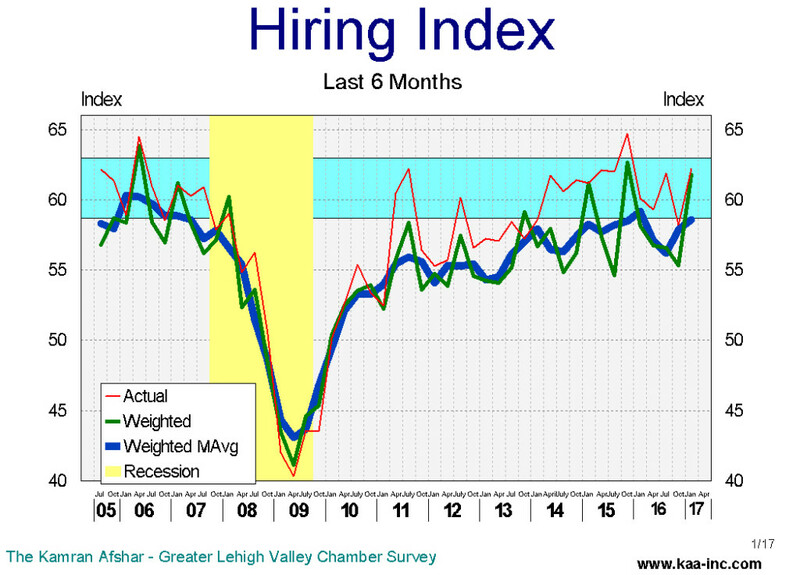 The index for actual hiring for the last 6 months dropped to 59.6 (seasonally adjusted and weighted, SAW) in April, below its January level of 61.8 (SAW), giving up 3.6% of its gain in January. 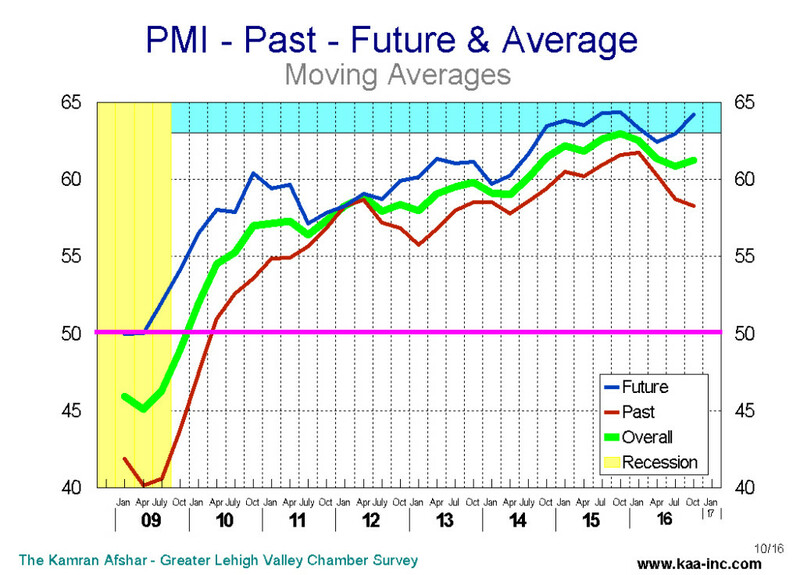 This dropped the index slightly below the range which is historically associated with faster growth in the Valley. 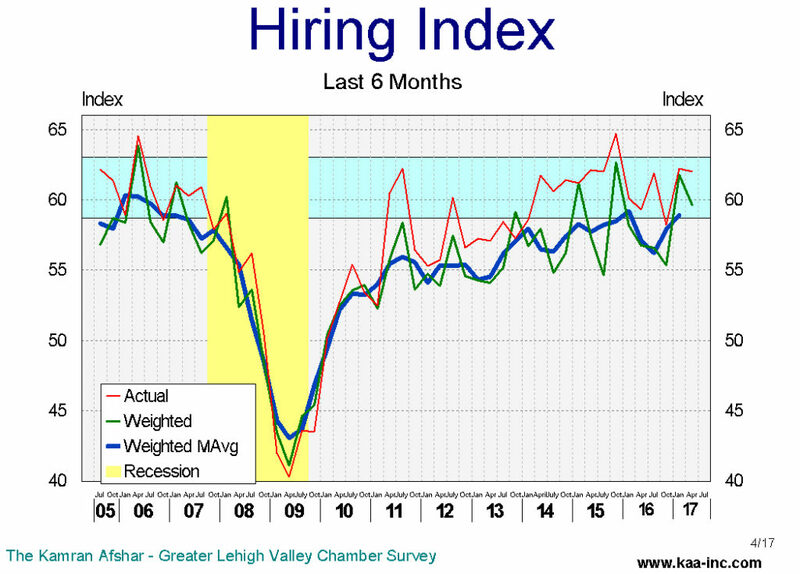 Local employers are not only facing a smaller labor pool, but of more significance, they are facing a shallower pool of skills and expertise within the remaining labor market; be it from high tech to low tech to no tech, many positions remain vacant for lack of qualified applicants. 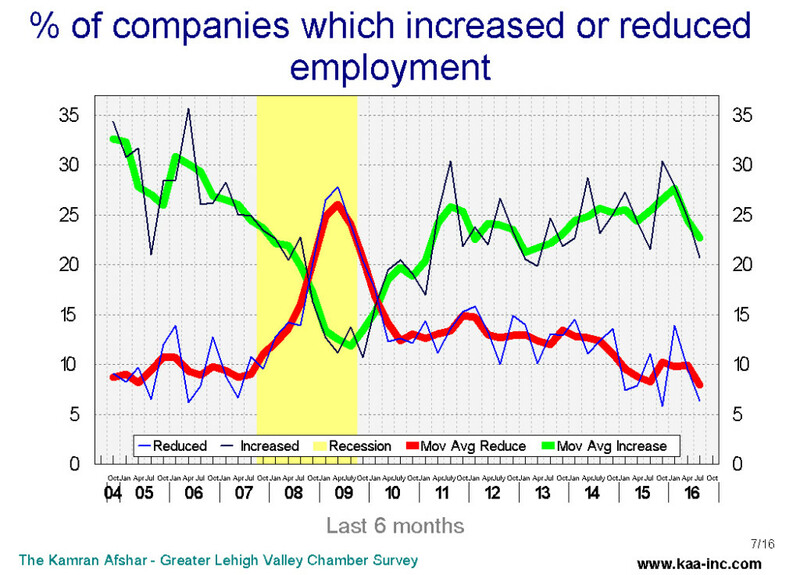 In the last 6 months, while local businesses hired more people, many of then trimmed their hiring back from what it was in October 2016 and January 2017. The smallest businesses in the Valley, those with less than 6 employees, which composes 55% of all businesses operating in the Valley changed their employment structure the least, 73% of them did not hire or lay off anybody and only a net 13% of them hired additional employees during the last 6 months. 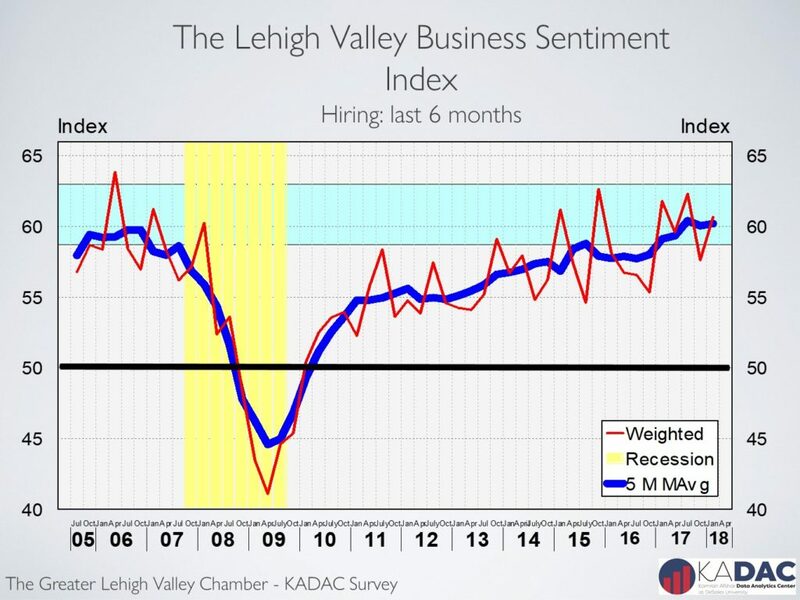 The largest companies in the Valley, those with more than 100 employees, which composes 3% of all the business here, showed the most movement. Almost half of them hired new employees, but this was not all gain, a quarter of them laid off people during the same period. All said, a net 26% of them hired additional employees during the last 6 months, and this is down from a net 47% in January. 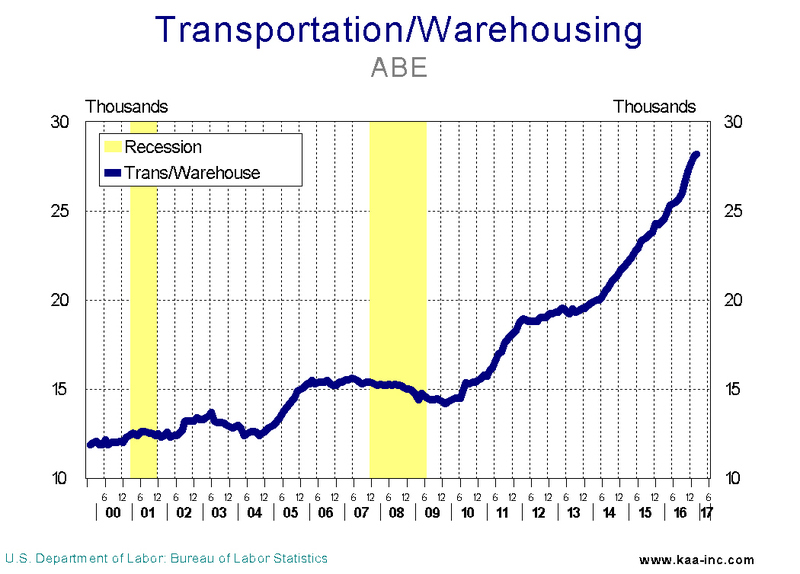 Transportation and warehousing industry has the lead in the number of new employees hired per company in the last 6 months. This is also the fastest. The index of plans for future hiring also dropped in April. This index lost a relatively small 2.4% of its value since January. 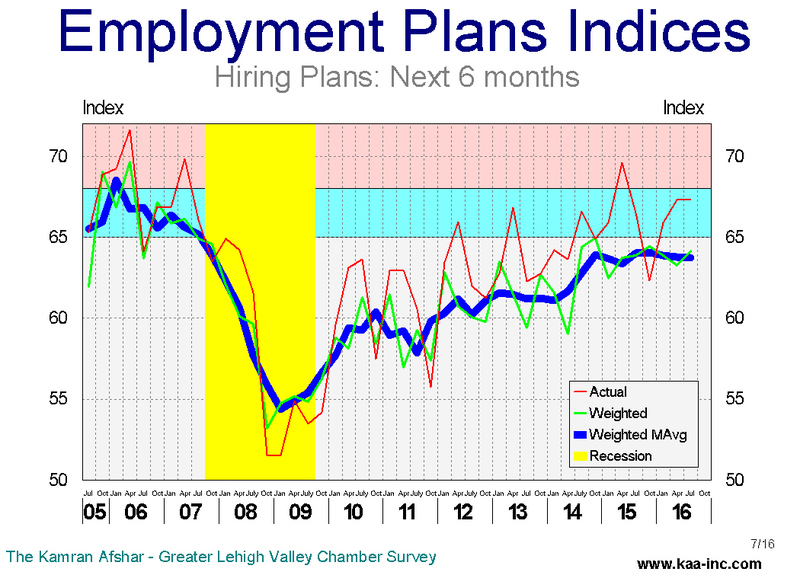 However, this drops the Plans for Future Hiring Index below the range which is historically associated with faster growth in the Valley. 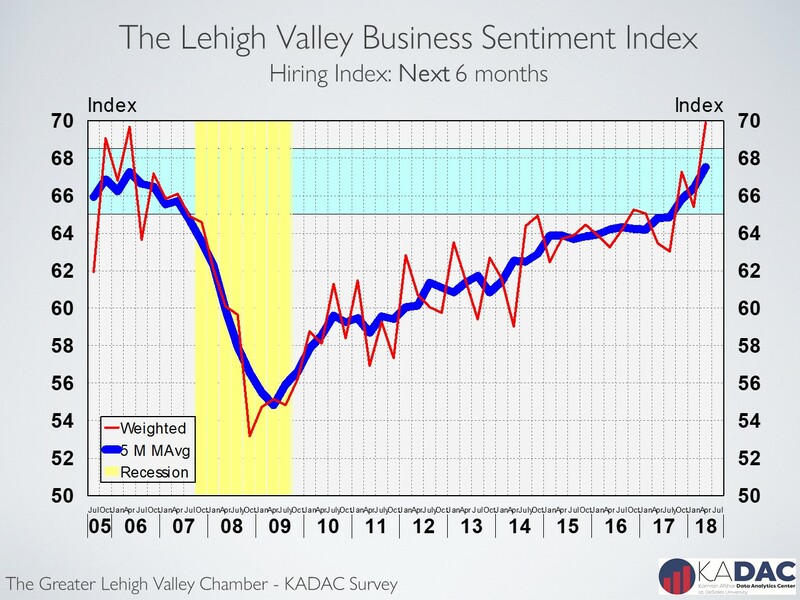 In the Valley, 8 out of 10 businesses with between 51 and 100 employees reported that they are planning to increase employment at their location. This is by far larger than any other group in our survey and is probably indicative of their business agility which larger companies lack and financial ability which smaller companies may not be enjoying. Transportation and warehousing industry is again in the lead among all the participants in the number of new employees that they are planning to hire in the next 6 months. The index for actual purchasing over last 6 months rose a shade to 67.3 (SAW) in April, an increase of 0.9% over its January level. However, it is a significant 7.9% above its April 2016 level. This index has now moved into the expansionary range since January. We also observed an interesting role reversal in April, the percent of larger companies which increased their expenditures dropped while that of the smaller ones rose. Purchasing plans for the future also recorded a small increase over its January level, rising to 66.5 (SAW) . This index also has crossed into the range which is historically associated with faster growth. And interestingly enough the largest increase in planned expenditures, percentage-wise, comes from businesses with less than 11 employees. Businesses participating in the survey did not experience an increase in their revenues in the last 6 months. 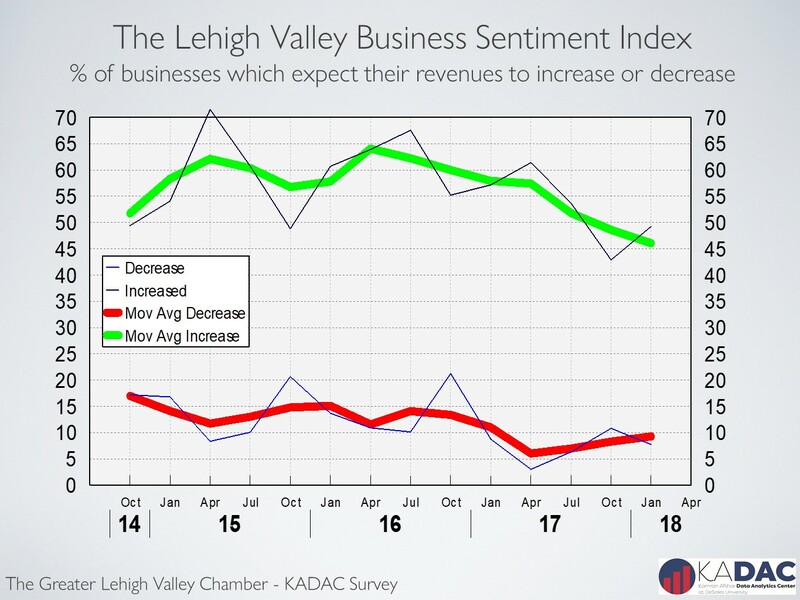 General revenues of the local businesses participating in our surveys has been showing a slight decline since July 2015. The larger companies in the Valley reported a small drop in their revenues while the smaller ones experienced increases in theirs. It should be noted that this indicator was added to our list in 2014, so we don’t have real historical references for it and therefore any comparison is based on short term data. 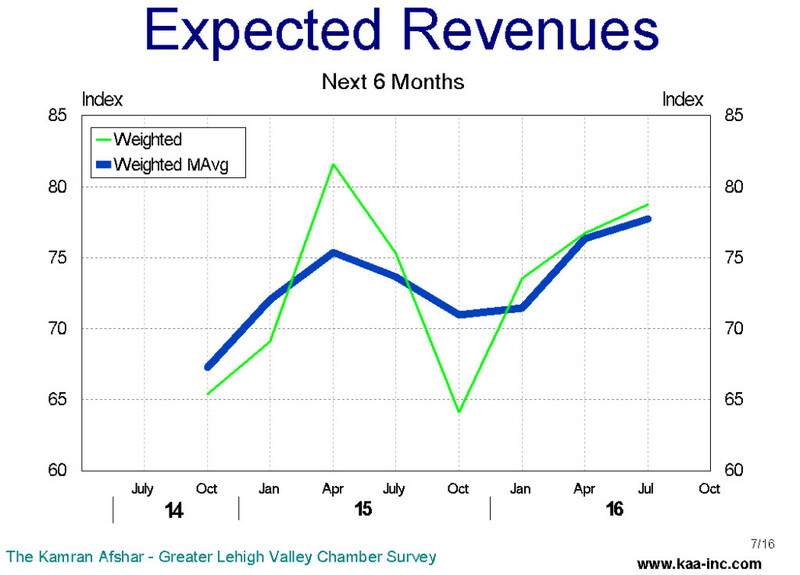 While local business expect their revenues to increase in the next 6 months, according to the April survey, their expectations did not rise anywhere close to what was anticipated with the tax cut and the stock market surge since the election. 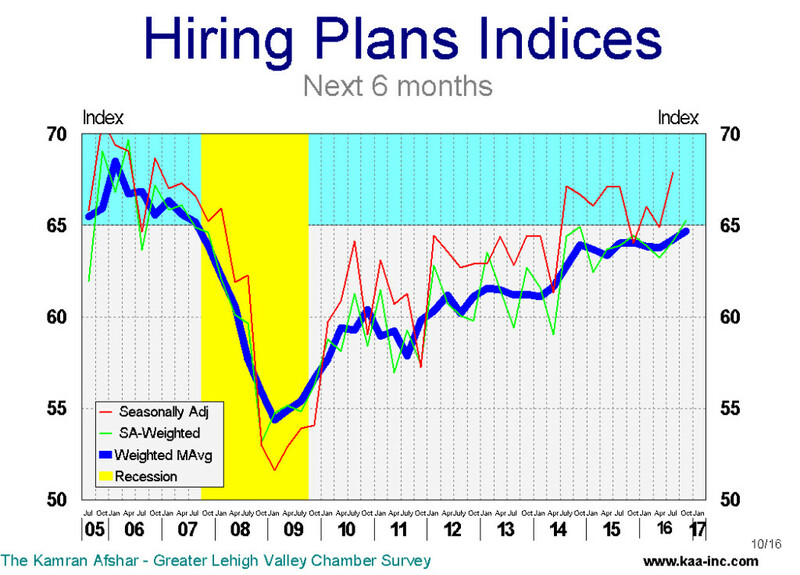 And not unexpectedly, the smaller businesses’ expectations are even lower than the rest. The index of expected revenues for the next 6 months rose in April, however, the trend for this indicator has been relatively flat. 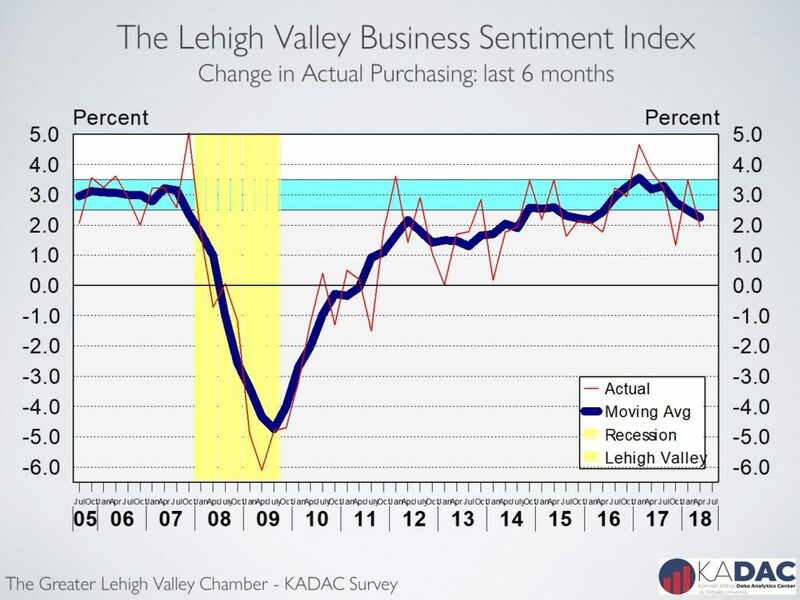 The survey of Lehigh Valley Businesses shows that the general optimism among local businesses which sprang up in January has lost some of its shine. 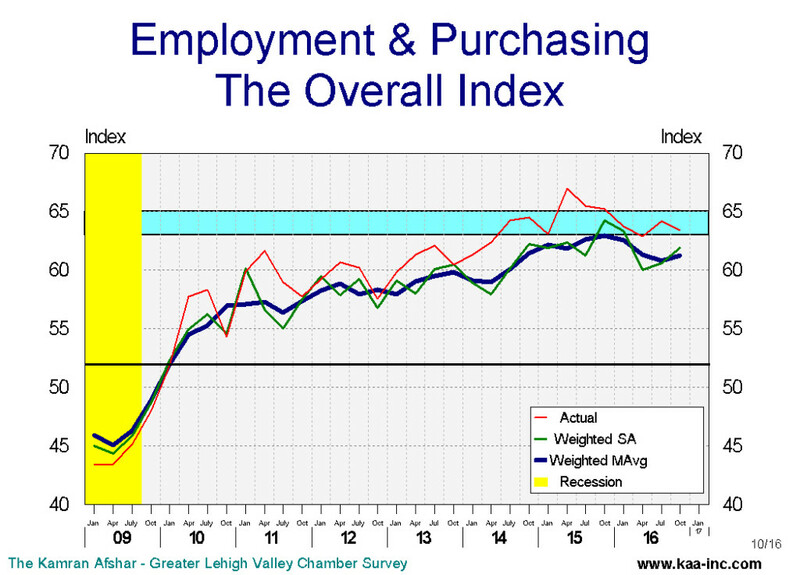 The expenditure indices moved up in April, and that is a sign of enthusiasm. However, the drop in employment indices indicated uncertainty. It appears that the “more-enthusiastic” January survey was tempered in April with a good dose of caution.